The USS ANDREW JACKSON (SSBN-619), a Lafayette-class submarine, was commissioned on 3 JUL 1963. USS ANDREW JACKSON served her country for 26 years, 1 month and 28 days, until decommissioned on 31 AUG 1989. Andrew Jackson (SSBN-619) was laid down on 26 April 1961 at Vallejo, Calif., by the Mare Island Naval Shipyard; launched on 15 September 1962; sponsored by Mrs. Estes Kefauver, the wife of Senator Kefauver of Tennessee; and commissioned on 3 July 1963, Comdr. Alfred J. Whittle, Jr., (Blue crew) and Comdr. James B. Wilson (Gold crew) in command. Following commissioning, the nuclear-powered fleet ballistic missile submarine sailed via the Panama Canal to the east coast. On 1 and 11 October, during shakedown training out of Cape Canaveral, Fla., she successfully launched A-2 Polaris missiles; and, on 26 October, she sent A-3X Polaris missiles into space in the first submerged launching of its type; and she repeated the feat on 11 November. Five days later and six days before his assassination, on 16 November 1963, President John F. Kennedy-embarked in Observation Island (EAG-154)-observed Andrew Jackson launch another A-2 polaris missile from a point off Cape Canaveral and congratulated Comdr. Wilson and his crew for "impressive teamwork." In late November, Andrew Jackson entered the Charleston Naval Shipyard, Charleston, S.C., for post-shakedown availability. The yard work was completed on 4 April 1964, and Andrew Jackson was assigned to Submarine Squadron 16, Submarine Force, Atlantic Fleet. In May, she departed her home port, Charleston, for her first patrol and continued to conduct deterrent patrols from the advanced base at Rota, Spain, through 1973. 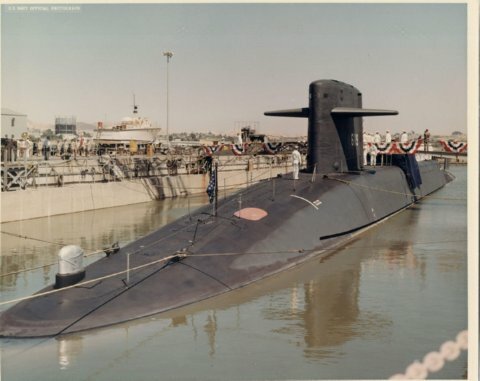 On 19 March of that year, the submarine arrived at the Electric Boat Division, General Dynamics Corp., Groton, Conn., for a conversion to Poseidon. This modernization and repair task was completed on 7 August 1975, and the ship sailed to Exuma Sound, Bahamas, for acoustic trials. Next she reported to Cape Canaveral, Fla., for Poseidon missile tests. In December, Andrew Jackson returned to Groton, her new home port, for the Christmas holidays.